Enjoy a long-lasting hummingbird feeding solution for your favorite bird-watching window or bench! As any bird enthusiast knows, a busy backyard feeding frenzy can go from full to empty rather quickly, but with a 32-oz. Hummingbird feeder from Best-1, you can enjoy observing wildlife without worrying about a disappointingly-short window of activity. Features a detachable base to allow hummingbirds multiple points of access, as well as durable construction that allows for easy disassembly and cleaning. In addition, the base is designed to only allow hummingbirds to feed, keeping other birds and insects away. Fantastic feeder!!! This feeder is ideal for my hummingbirds. The bees do not bother and other birds do not attempt to feed from it as they did with a different feeder I used to use. Its large capacity is very good. I have had as many as 4 birds feeding at the same time. It is easy to clean. Very good disc shaped feeder that some of our ruby throat hummers enjoy using. Easy to fill, easy to clean, and stands up well to the weather. Like the feeder,but only, one problem is with BEES.Can't keep them away! I've used your feeder for years and was pleasantly surprised when I ordered a new one for a friend and found replacement parts--needed the feeder platform. 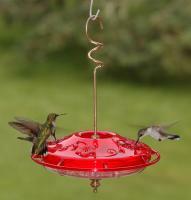 This is a great feeder and hummers gather quickly and easily. Great product. I have used the 32 ounce feeder for several years. It looks and works as good as the day it was bought. Ordered because had problem with wasp and bumble bees on feeders solved my problem the wasp land but don't stay and bees don't even light on feeder. It is the best hummingbird feeder I have ever owned. No other can come close to comparing. I have several of these and really like the size. During peak times, I fill them daily and the hummers put on quite a show. Smaller, often prettier feeders would need to be filled far too often. This is definitely Bee Proof as advertized! I would of liked to have known about the availability of a 5 ounce bottle before ordering the 32 ounce. Love the product & your excellent service. Sturdy, durable, well designed and the hummers love it. This hummingbird feeder is one of the best for cleaning and wind resistance. I highly recommend it. My neighbor has 4 bee hives, and we have thousands of bees in our yard. We have tried many, many different hummingbird feeders, any so far, yours is the all time best at keeping the bees off. I now have 8 of your feeders, and next year, I will replace the remaining 4 with yours, assuming they continue to be bee free. We now have about 30 hummingbirds. I already had one of these and liked it so much I ordered two more. It does not leak as all the other feeders I have tried do. Also like the fact that when I am on vacation and can't freshen every 3 days, I can fill it with enough food to last my hummingbirds until I return. It's great. Attracted humminbirds right away. My sister had given me a hummingbird feeder like the one I purchased. I really liked the design and wanted another. Would recommend this type to anyone who would ask about a feeder. Great product. Saw alot of them in AZ while on a birding trip last June. Wish I had stuck with this brand rather than trying one of the top-loading feeders that leak like a sieve! Great feeder, quality is unbeatable. These are the best hummingbird feeders. Thank you. This is the only hummingbird feeder I've found that doesn't leak - ever. The hummers find it within hours of putting it out for the first time. From my perspective it is easy to fill and keep clean. From the birds perspective, they flock to it - no pun intended - so that's all need be said. We give this a five. Nice product. It was purchased as a gift for family in Az. They appear to love it. Hummers flocked to it as soon as it was hung, and not only hummers it was noticed that the nectar seemed to vanish extremely fast. One evening bats were observed feeding on the nectar. Now it's being taken down at night and replaced early morning. Now you can advertise it as a "multi-feeder" for hummers AND bats at least in Arizona! This product is Great. My little Hummers really like it. They are pretty much gone for now, but they kept coming back for more. It so easy to clean and holds a lot of liquid. I recommended it to my friends. Thanks for a Great product!! I love my hummingbird feeder. This is the second one I have purchased in the past four years. I have tried many hummingbird feeders in the past, none compares to the Best-1 in durability, ease of cleaning,and ease of filling. As long as you have these available they will be my only purchase. As a matter of fact, I don't have a second choice. I had purchased two of the 8 ounce bottles and needed a larger one for a rental we own some distance away. I really like all three of them. They are very easy to clean and I am able to see how much food remains. The plastic bottoms are repairable, as I found out after I dropped one of the 8 ounce bottles with the bottom attached. Super glue worked well to reattach the threaded connector in the bottom half to the bottom again. Thanks for a great product. I have had one for several years, liked it so, well this one was ordered for a Christmas gift. It took the hummers a little time to get used to it, but it soon got crowded. I also liked the "no bees", although when I cleaned it, there were bee bodies of those which crawled in through the holes. I still like the old one too. The hummers like to stick bills in the little yellow flowers. Love to watch the little tongues which resemble fishing line. They normally leave this area the second week of September, but this year it was the last week...this past Tuesday, they left. Absolutely the BEST hummingbird feeder ever designed. This feeder is the best I have ever purchased! It's easy to clean and fill, and the birds love it. It has every feature that one could want in this type of feeder. The one I just bought was a gift for a relative, so I don't know if it is attracting many hummers. But the same unit I bought several years ago is still working well for me. We were observing as many as 5 hummers feeding at once from it today. It works great! The hummingbirds like to perch and sip the nectar. I like the improvements that were made. It is easier to clean. I have had your older model for many years and just now had to get another one...more birds! I bought one for my granddaughter to enjoy, too. Best hummingbird feeder, for sure! It was fast and smooth! Thanks! Living in South Africa, I do not have access to the variety of feeders you are used to but this is probably the best product (in it's own field). It has been my pleasure to acquire in the last 10 to 20 years and that includes 2 Mercedes Benz's, highly overrated vehicles! 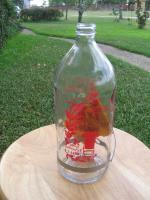 The Best1 hummingbird feeder is VERY easy to clean and refill. On a busy day I've used up to 12 liters of syrup, having to refill every 1.5 to 2 hours with 50 to 60 birds feeding! The quality of the plastic bottom is excellent and the glass top all put together makes for an excellent product! This is a good solid feeder and your website was quick to fill the order and send it. I was impressed with the product and your website. My partner and I discovered this hummingbird feeder while pet-sitting. We have a pet-sitting business and are accustomed to maintaining feeders. This was, by far, the best design. Other feeders have actually attracted and even trapped bees making it difficult for hummingbirds to feed and dangerous for us to check. This feeder is completely bee and wasp resistant. When we bought our home last October, we went on-line to find this product and were excited to place it on our porch as one of our very first home decorations. The hummingbirds tend to sit on the bottom edge and often, several will feed at once and so, this makes for lots of fun hummingbird watching. The feeder is extremely well made and is MADE IN THE USA!!! It is also convenient to re-order the base or glass top in the event that this is ever necessary. You do not need to replace the entire feeder. I like that the bottle is made of thick and durable glass so that plastic toxins will not seep into the hummingbird "nectar." Many feeders are plastic. The feeder is good at attracting hummingbirds without the need to add food coloring to the water. The bottle has red lettering and red designs and the base is also red. The feeder is also very easy to clean. Overall, this is a well designed, environmentally conscious, reasonably priced and an attractive product. We will be buying several to give as gifts next holiday season. Lisa and I love this hummingbird feeder and rate it at 5 stars without hesitation!! I am impressed with this feeder. It is good quality materials even if the feeding part is plastic. We have two of these feeders and we just gave one for a Christmas gift. The hummingbirds love them! At times there are over 15 birds at one feeder. They are easy to clean, and I love the fact that in our disposable society, replacement parts are easily available. The only problem I've had is the paint peeling off of the outside of the glass on the most recent feeder purchased. Even so, I still give the product 5 stars. I have used these for years and have 4 feeders. I wish they had a 16 oz. model for fall and spring. I sent these as a thank you gift. We have used them for years. They are the BEST and aptly named "Best 1." We tried every hummingbird feeder we could get our hands on, including a handmade ceramic artisan model, and nothing beats the "best". We put out two at once on either side of a juniper tree that offers good perch and cover for the little buggers and WOW, the show is on all Summer long. It is unbeatable, easy to clean, and a large capacity! We have used this product before and this is the reason we ordered this one. This was a replacement for a similar feeder we'd used for over ten years. Our hummingbirds are too spoiled and wouldn't use any of the ones we could buy locally. I had a Best-1 hummingbird feeder for years and it proved to be totally wasp proof and bee proof. The wasps and bees would circle around it and try to feed from the feeding holes and eventually give up. If they had shoulders they would have shrugged in disgust. My original Best-1 was broken and I could not find anything that promised to do the job any better.This is an excellent product! This is a great humming bird feeder! They really seem to enjoy it. I make my own nectar with no coloring and they love it. I would highly recommend this feeder. I use the 32oz glass because its easy to clean. During the middle of summer I am filling 6 bottles a day. I go over 100lbs of sugar easy. I won't use any other hummer feeder. It has a great design and it is easy to refill and clean. The delivery was prompt. We have gone through many feeders. The problem being that we have more Flickers using them than Hummingbirds. They pull out the removable flowers that come on most feeders and then the bees get in them. This feeder has the perfect size orifices to allow both types of birds to feed. 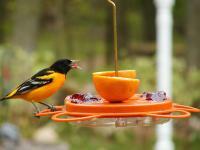 We love these feeders and so do the birds. We have bought them for friends, as well and they love them. We like the large bottle that holds 4 cups of food as well as the 8 holes. It has enough room for everyone to feed. We have four of these feeders up all of the time, and sometimes all of the feeders will be full of hummingbirds. One other important thing is that they do not attract bees like other feeders do as they have no yellow on them and bees are especially attracted to yellow. These feeders are great! This feeder is the best! The hummers love it and it's super easy to clean. The item came well packed & in a very short period of time after I ordered it.I am enjoying the feeder & have many birds feeding each day, It is easy to clean & looks nice. The birds love it and it is so easy to clean. I like it better than the original we bought 15 years ago. This is now the only hummingbird feeder that we use. We have about eight. They are easy to clean and do not break easily. Several birds can use it at one time. I have had two birds sit on my finger at once and drink together out of the same little "hole." This is the best hummingbird feeder that I have found! I have had one for years and it is so simple and easy to fill and to clean. I have given many as gifts over the years and now, we sell these at our nursery and customers just love them! 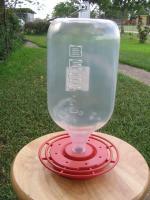 This is a great hummingbird feeder and it is so easy to use. The hummingbirds love it! These are the best hummingbird feeders I have ever had! I now have 10 of them and Hummingbirds are everywhere. Last count 40+. Thank you for the great service and super product. The items arrived well packed and intact. It works very well! The birds come to these fast and drink their hearts out. It is easy to put together, well made, (don't put in dishwasher) besides who needs to, and they are very easy to clean between fillings. These are the best type of hummingbird feeders because they are large in capacity and they're easier to clean. I recommend them over the usual ones you see in the stores! This is an excellent feeder. We live in a very warm, windy climate. I needed a hummingbird feeder that will not be damaged by the sun, and is heavy enough to not swing. This glass feeder is top of the line. We had hummingbirds sitting and feeding within two days of hanging this. We already have one of these feeders and wanted a second one because we like them so much. My husband said they are very easy to clean and fill. Plus the hummers certainly seem to like them because they can sit all around the bottom. I love the hummingbird feeder and I only have one problem! This is a great hummingbird feeder. I like the way it is so easy to clean! 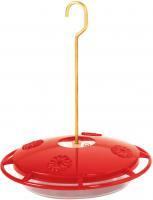 It is a great style of hummingbird feeder. They come everyday! Great! It stays clean longer than plastic feeders. This is truly the best hummingbird feeder that I've had and I've had a lot of them. The birds really like it and I like it because it stays cleaner than most others I've had. I might like a little smaller version because since I change it twice a week I definitely don't need to fill it full but other than that it's great. 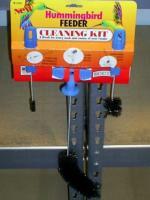 It is a very good product, easy to clean and the volume is large enough. I am very pleased with the quality of workmanship. I particularly like the design of the feeding ports that nearly excludes bees. I like the design of the feeding tray that allows for easy cleaning. My only complaint is the difficulty in cleaning the bottle because the threaded opening is too small to allow a bottle brush. I would prefer to have a threaded bottle opening more like a "Mason jar". This is a great feeder, but telling us to clean weekly is totally unrealistic. I think the Best hummingbird feeder is a good product! Two times we saw hummers come take a look and leave. This without a doubt is the worst feeder we have ever owned. You should be ashamed selling it. For yellow jacket lovers it works great, a minimum of 8 users at all times. I have found nothing good about this feeder. It attracts just as many bees as the ones I had before. I'm very disappointed that it still attracts bees when it's not supposed to.